Egypt’s former President Hosni Mubarak has been sentenced to three years in prison after a Cairo court found him guilty of embezzling public funds. Hosni Mubarak’s two sons, Alaa and Gamal, were also convicted and given four-year terms. The three were also fined $3 million and ordered to repay the $17.6 million they were accused of stealing. 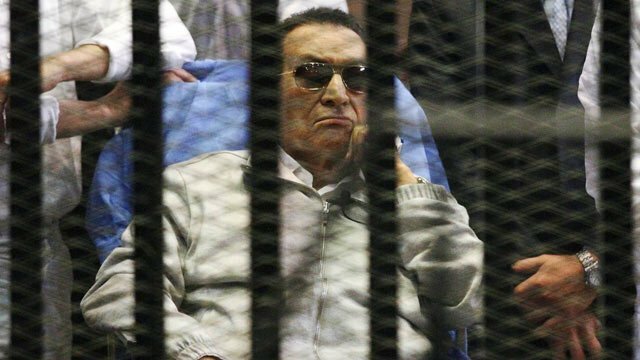 Hosni Mubarak, 86, is also on trial for abuse of power and conspiring in the killing of protesters during the 2011 uprising that forced him to resign. He was found guilty of the charge relating to the protesters in 2012 along with former Interior Minister Habib al-Adly and sentenced to life in prison. In January 2013 the Court of Cassation upheld an appeal by the two men against their convictions on technical grounds and ordered a retrial. In August, a court ordered Hosni Mubarak’s release from prison and transfer to a military hospital in Cairo, where he is being held under house arrest. Public attention in Egypt has largely shifted away from the case since the military overthrew his democratically-elected successor, Mohamed Morsi, in July. Mohamed Morsi was in turn put on trial on a variety of charges, including incitement to murder, espionage and fraud. Despite the subsequent return to power of many of their associates, the Mubaraks were charged with embezzlement in February. They were accused of diverting $17.6 million meant for maintenance of presidential palaces to renovate their own private residences. They denied the charge and asserted at the trial that the prosecution’s case was “completely unsubstantiated because it never happened”. For the verdict on Tuesday, Hosni Mubarak sat in the caged dock in a wheelchair, wearing a grey suit. His sons stood beside him in white prison clothing. It was not clear if the three years Hosni Mubarak and his sons have spent in custody would count towards their sentences, and also if the former president would return to the military hospital or be sent to Torah prison.